BEAUTY AND THE BEAST WIGS . 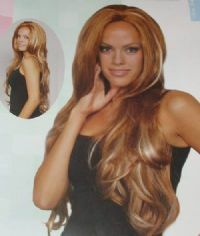 PLEASE ALLOW UP TO 3 WEEKS FOR DELIVERY OF THIS WIG. IF YOU PURCHASE 6 OR MORE I WILL HAVE THEM DROP SHIPPED FROM MY SUPPLIER AND YOU WILL RECEIVE THEM FAST. THANKS. Gorgeous skin top. Overall 30 inches long. Lots of layers and comes in many colors. Allow 2 weeks for delivery because this will need to be ordered from my supplier.